Rao’s meatballs. If you’ve ever had them you know. Possible the best meatballs ever. These are those meatballs and this is that marinara sauce. The one from the fabled little restaurant in Harlem. The restaurant Madonna can’t get a table at. I’ve been to Rao’s (the copycat one in Las Vegas) and I’ve had the meatballs. They are epic meatballs. Seriously. Tender, moist, flavourful. Rao’s meatballs are the best meatballs I have ever tasted. They are simple but somehow magical at the same time. It’s totally worth the effort to make these at home. The version floating around the internet is close I think except for two little details. The internet version has you make the meatballs 1 1/2 inches in diameter. And you only simmer the meatballs in the marinara for 15 minutes. In the restaurant, Rao’s meatballs are bigger. Way bigger. And they taste like they’ve had a good long simmer in the marinara. You barely know where the meatball starts and marinara ends. I have the Rao’s cookbook. In it, the recipe is pretty much word for word the recipe in the New York Times. But something’s missing. They aren’t quite magical. Time. You need to simmer them longer. That’s where the magic starts to happen. That is the real key to this recipe. 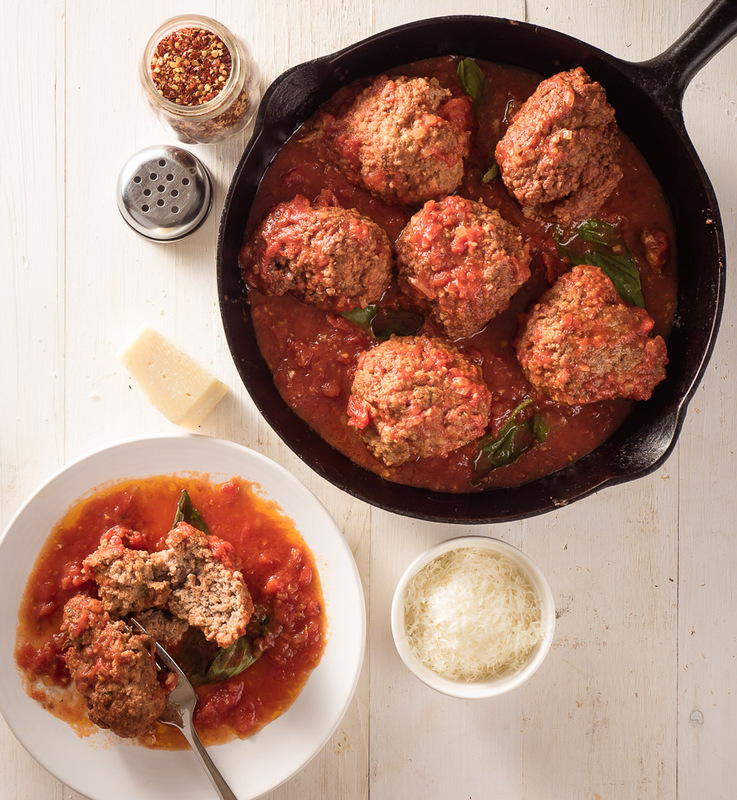 To get the full Rao’s experience you need to simmer them in the marinara. For an hour. Or more. San Marzano tomatoes are a big part of this recipe. Try not to skimp here. There aren’t a ton of ingredients in this recipe so there isn’t really anywhere to hide. Once you try genuine San Marzano tomatoes I think you’ll understand. 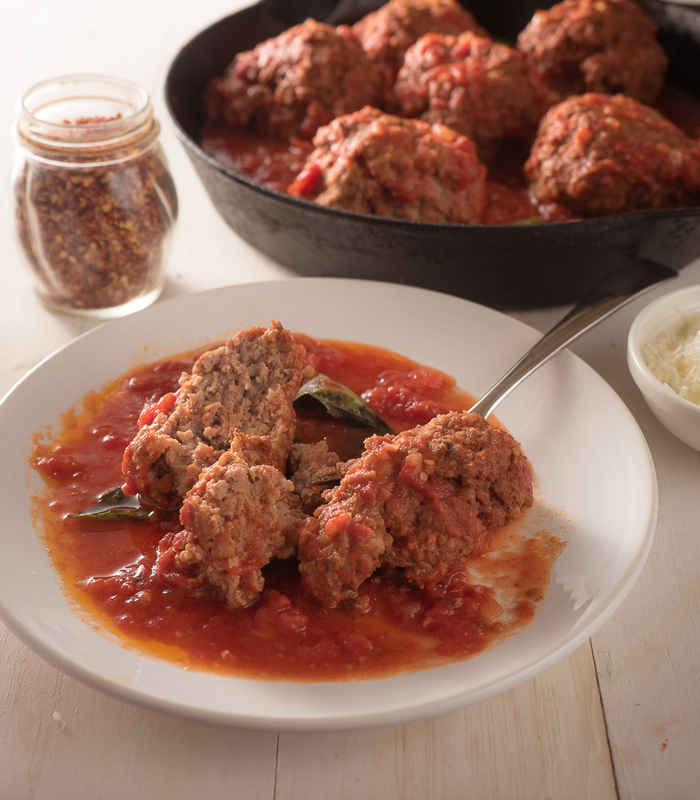 Rao's meatballs are famous for a reason. Big, tender, and floating in the best marinara sauce you've ever tasted. Heat the olive oil over medium low heat in a 5-6 quart dutch oven or pot of similar size. Add the fat back or pancetta and cook until the fat is rendered. If you use fat back, remove the rinds. Pour in the crushed tomatoes, add the salt and simmer, loosely covered, for about an hour. While the marinara simmers prepare the meatballs. Break up the pork, veal and beef in a large bowl to start mixing them together (it doesn't have to be perfect - just get it started). Add all the remaining ingredients except the water. Mix using your hands to roughly combine. Add the first cup of water and mix. Continue to add the water until you get the mixture to be fairly moist. You are going for a meatball that holds together but isn't at all dry. Most of the time it takes the full two cups or very close to it. Form the meat mixture into 8 large meatballs about 2 1/2 - 3 inches in diameter. Place the meatballs in the fridge for around 30 minutes to set up. Shallow fry the meatballs in a non stick skillet until golden brown. You will be cursing me if you don't use non-stick. I find a 10 inch diameter pot with 1 1/2 cups of oil gets you to the point where half the meatball is submerged when cooking 4 at a time. Cook until golden then nudge them over with a slotted spoon to cook the other side. Drain on paper towel and then add them to the marinara. 8 meatballs will just fit in a single layer in a 5-6 quart dutch oven. Simmer about one hour, loosely covered. Your marinara will have simmered two hours in total. To serve, cook spaghetti per the instructions on the package. Drain and toss with a bit of the marinara. Serve with grated pecorino romano as a first course. 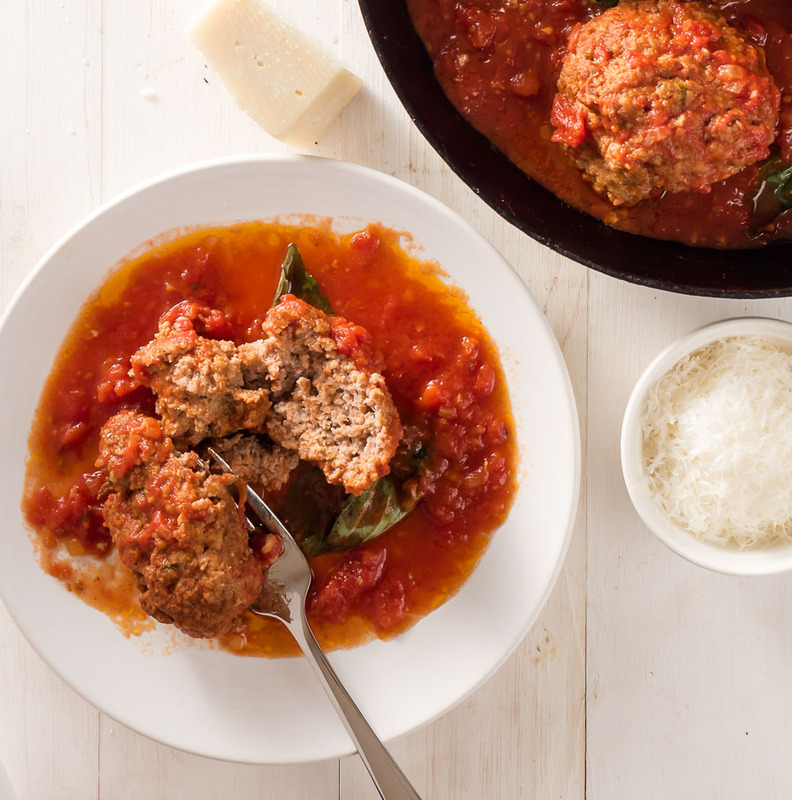 Serve the meatballs with the marinara sauce, sprinkled with more pecorino romana as a second course. One giant meatball alone on a plate with a puddle of marinara sauce is a bit of an unorthodox presentation but live a little. In american, appetizer, beef, italian, main course, meat, pork. Bookmark the permalink. For as long as I can remember, my birthday dinner has always been spaghetti and meatballs. Not spaghetti and meat sauce, although now as a grown-up, I can understand why busy parents go that route every now and then. I still make myself meatballs for my birthday if I’m not visiting back home. Needless to say, I am very, very excited for this recipe! Come October, I’ll be using this recipe, thank you! I would be delighted if you tried these meatballs on your birthday! Nothing like a Rao’s meatball!! I see why they’re so delicious. I think it’s all those homemade touches (like hand crushing tomatoes) and putting in the time (yes, simmer them in the gravy!!) that make these so amazing. Wow – that is a kind comment. I really hope you like them! They are the best meatballs I have ever made. I love the the simplicity of his recipe. The nuttiness of the pecorino romana cheese adds great depth to the richness of the meatballs accompanied by the subtlness of the marinara sauce! This is a GREAT dish! Thanks for sharing! That’s awesome. Hope you love them and I can’t wait to hear! Double-you-owe-Double-you. Wow. So these were so delizioso that I was ordered to make them again this weekend for my Italian in laws. No pressure at all! Thank you for sharing. Quick questions for you : If I were to use only beef would the taste be dramatically different? Thanks! Thank you but I can’t take much credit. 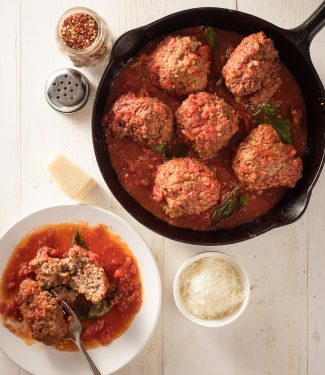 These are Rao’s meatballs – I just figured out the step they don’t tell you in the book. I think they would be wind up a bit dry and less delicately flavoured if they were just beef. The pork adds a bit of fat. The veal lightens the overall taste. Good luck with the in-laws! I have been cooking meatballs for years trying to find THE recipe. Found this on NYT and tried. Eureka! I can stop looking. My search is over. I really do think Rao’s deserve an award at the meatball hall of fame! Sounds GREAT! Can I add meats like Sausage, pork and beef to the sauce along with the meatballs? I don’t see why not. It will not be the same as what they serve in the restaurant but it sounds delicious to me!